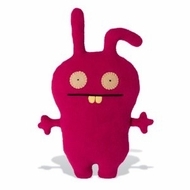 Join the UglyDoll craze that's sweeping the world. UglyDolls are plush lovable characters that show us that being ugly means accepting our differences and embracing our flaws. UglyDolls also have a great sense of humor and know how to have fun. Meet Little Bent: Little Bent is out of control. Nonstop moving around. Looking out the window all day long day dreaming while doodling. There’s no stopping this one. You know those things called stop signs? Good luck trying to explain those things to Little Bent. And there’s nothing little about this big time go getter. Know how sometimes when it is super quiet and you can hear a tiny ringing in your ears? That’s Little Bent in another country ordering lunch. I know right? Doll measures approximately 24" x 18" x 4". UglyDoll is a winner of Best Toy awards from the Toy Industry Association TD Monthly Oppenheim Funfare Parent's Choice iParenting Creative Child and many more. Recommended for children age 3 and up. UglyDoll - pretty ugly.